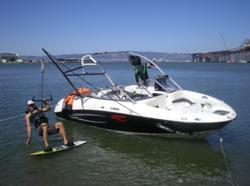 Using a new approach in its training program, Kite the Bay utilizes a support boat and KitePole. San Francisco kite surfing company, Kite The Bay, offering kite surfing lessons throughout the San Francisco area, is currently employing a new approach to teach students how to kiteboard expertly. Kite the Bay now uses a support boat and a KitePole to enable students to concentrate on achieving the proper body and board balance on the water’s surface. During kiteboarding, also called kite surfing, the kite provides the pull and lift needed for the surfer to move, while the board provides the platform on which the surfer stands on. Enhancing board skills early on guarantees a faster learning progression. The support boat, christened “Windseeker,” is a 21-foot Yamaha jet boat equipped with a KitePole that helps students to develop proper board stance. Being hooked to the KitePole creates lift for the student while not needing to worry about steering the kite. This ensures students focus on mastering the right body and board posture, after which, they learn proper kite steering. Kite the Bay has offered the most exciting and efficient kite surfing lessons and scenic tours on the San Francisco Bay for years. For more information about its teaching methods or any of Kite the Bays’ services, call 650-273-0080 or view the company on the web at http://www.Kite the Bay.com. Kite the Bay offers the ultimate San Francisco kite surfing experiences on the bay with the Golden Gate Bridge and the San Francisco cityscape in the background. Its head instructor, Capt. John von Tesmar, is a PASA-certified, Level Three Instructor with 12 years of teaching experience. Capt. von Tesmar was issued a captain’s OUPV license by the U.S. Coast Guard in March of 2010.